Note: Keep a running tally for the total number of repetitions and calories. During the one minute rest rotate stations in the order listed above. Each calorie will count as a single repetition. Up to three Athletes per each station. After each Athlete has rotated through all five stations, rest five minutes and repeat, beginning at a different station than you first stated. Goal on the second round is to match first round effort. The first time we ran this workout, we had some top-notch efforts and scores. Be sure to check your fitness journals and get ready to set a new record! 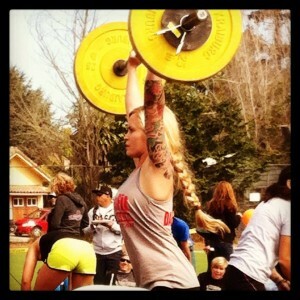 Danielle rocks it at her first CrossFit Competition! The CrossFit Amundson Mobility Class is tomorrow night from 6:00 to 7:00 PM at our Krav Maga studio. Please be sure to attend this very important class.